the month of May as Motorcycle Month on the Trace! 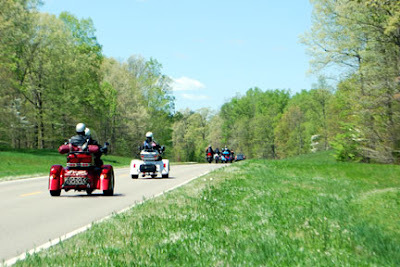 444 miles in length, the Natchez Trace Parkway takes travelers from Natchez, Mississippi to Nashville, Tennessee. The “Trace” has been designated as one of America's National Scenic Byways by the Federal Highway Administration. 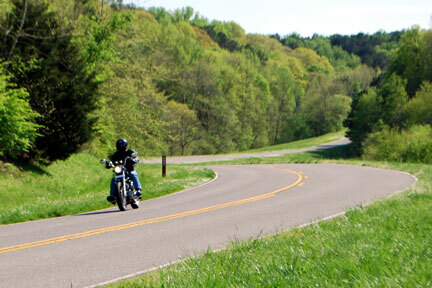 31 of the most scenic of these byways, including the Natchez Trace Parkway, are also designated as All-American Roads. 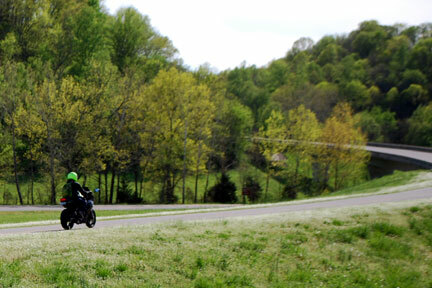 When the weather is nice for riding we often see more motorcycles on the Trace than cars! April, May and June along with September and October are the most popular times to enjoy a day ride, weekend outing or week long excursion on this historic and scenic national parkway. The month of May is usually the best weather month with high temperatures averaging in the high 70s to low 80s. These pictures were taken in late April. Traffic is generally very light except around Tupelo and Jackson. Often there are more motorcycles on the road than cars. No stop signs or stop lights. Access on and off the Trace is via on/off ramps which means no need to worry about cross traffic. The parkway is clean and smooth. One motorcyclist said it was "like riding on a cloud". Scenery is awesome. Instead of utility poles and buildings, the Trace is lined with forests, farmland, creeks and beautiful vistas. All along the Trace through Mississippi, Alabama and Tennessee, historical and nature attractions offer interesting breaks and rest stops. Restroom facilities on the Trace are available about every twenty to thirty miles. Contrary to popular belief, there are gas stations, markets and restaurants near the Trace. It is true that none of these services are right "on" the Trace - after all, it is a national park. Numerous side roads take you past antebellum and victorian homes, sunken roads, civil war battlefields and southern towns. There are many "motorcycle friendly" bed and breakfasts located along and near the Trace in Tennessee, Alabama and Mississippi. This blog is about traveling the Natchez Trace Parkway. The "Trace" is a 444 mile-long federal parkway that generally follows the path of the 200+ year-old "Natchez Road". I own/operate the Natchez Trace Bed and Breakfast Reservation Service and NatchezTraceTravel.com.